Male, female, old, young — no matter the demographic, everyone should be able to defend themselves at a moment’s notice. Being able to carry your defense weapon is a different story. If you attend a concert, movie, shop at most major stores, or even take a stroll in the park, it can be impractical if not illegal to carry a gun. However, most people always keep their keys close by. Self defense keychains are a practical, economical, and legal way to be able to defend yourself in any situation. We have compiled 7 of the best personal defense keychains to allow you to make an educated decision about which to purchase. For an untrained eye, these keychains are innocent key fobs with not much use. It is a stick that is about five to six inches long, typically made out of metal or can be made from a hard plastic. Kubotans can be used as a striking mechanism themselves or be used to reinforce the fist when throwing a punch. If you find that a kubotan is a weapon of interest, it is advisable to learn from a certified kubotan instructor. This will teach you a number of effective techniques to defend yourself should the time arise. These keychains can look similar to a cat’s face. They are quite cute and unassuming, but the holes that serve as eyes are wide enough for your fingers. Once your fingers have been inserted, you can use the pointed ears to defend against a would-be attacker. Spiked impact devices come in many shapes and sizes, and it is possible to find some without the spikes. Some of them also may also feature other options like a bottle opener which can definitely make the appear to be even more friendly. With that said, pepper spray can be a real pain (pun intended) when used incorrectly. It can also be ineffective if the spray used is taken by the wind only to be blown back on you. This means that when choosing a type of pepper spray, be sure that it is a stream, not a mist or aerosol. Choosing a pepper spray that disperses in a stream also allows for the same effect to be achieved while giving you time to move away from danger. As adorable as an inchworm sounds, these keychain weapons are anything but. They are technically used as a small ruler, with inches on one side and centimeters on the other. It is a very simple design, with most being made out of titanium and only about three to six inches long. However, if you find yourself in a dangerous situation, this is a great improvised weapon to have in your hand. 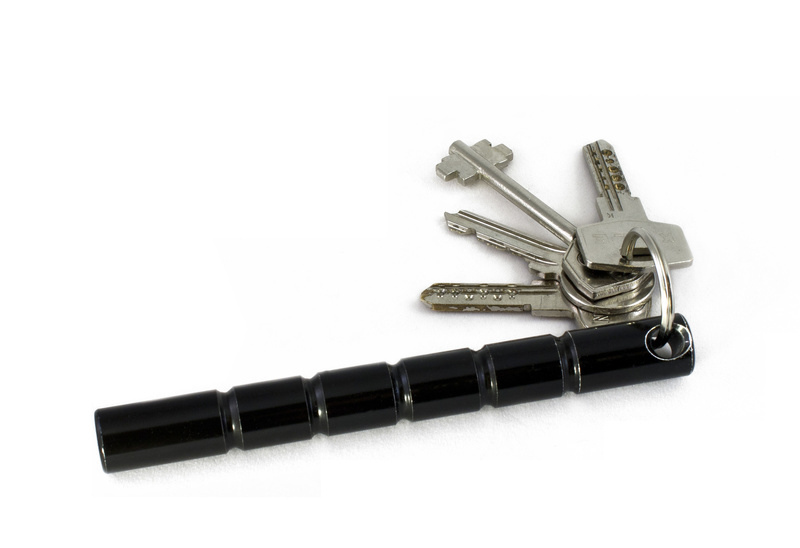 Because it is considered a ruler or measuring device of sorts, many places that have legislation about self defense keychains can’t outlaw it. Yes, these are actual titanium toothpicks. However, they are also keychains that can all you to discreetly carry a concealed stabbing implement. Titanium toothpicks are great because you’ll always have a toothpick after eating that fried chicken or other stringy food you love. But, they’re also easy to screw together as a makeshift (and legal) weapon. Ideally, you will carry another type of self-defense weapon and use this as a back-up. This is because it does take a second to screw the sharp part to the base–and that split second can give your attacker the upper hand. Chances are, you’ve seen these keychains before and didn’t know what they were. These self defense keychains are the one that looks like a ball, wrapped in a braided or woven rope, attached to the keys. The ball is actually solid steel, and the rope is paracord. The paracord actually unravels to give you about 14 feet of cord that can be used in a survival situation. Unlike some of the other keychains mentioned, this one can be swung at an assailant, which gives you the benefit of added distance. There are alarm keychains on the market that will emit a deafening sound if the button is pressed. There are also flashlight keychains that have extremely bright bulbs that will blind anyone that is pursuing you. Both of these methods can work well but you need to remember that you’ll have to hear the alarm, too. This means that you’re going to be just as deaf as an attacker. With a self-defense flashlight keychain, you can shine the light directly into your attacker’s eyes. They will be temporarily blinded, not you. This gives you the time to run to safety and call for help. Also, if you don’t want to have this on your keychain, they are easily stored in purses, pockets, or on waistbands. No matter your situation, you almost always have an improvised weapon at your fingertips. If you choose to not use or purchase any of these self defense keychains, you still have your own keychain. Keychains and keyrings typically have multiple keys that can be placed between your fingers if you notice odd behavior. With these keys between your fingers, you can stabilize any blows to the assailant, having the added benefit of impact from the keys. Many people are fond of owning guns and carrying knives and that’s great, in the United States, people have the ability to do so. However, many areas do not allow for people to carry their firearms openly and some people aren’t fond of knives. Self defense keychains allow for you to be safe, legal, and not have to worry about all of the training needed for more complex weapons.